Today was one of those days where things just sort of come together. Instead of going after fish, I was content with just getting out. It was a perfect day, no wind, somewhat overcast, and not too warm or cold. The flows had lowered to a safely wadeable level so I decided to fish one of my favorite spring time spots near school with no expectations and I was not disappointed. On the way there, I passed a local freestone that had two cars parked at the access suggesting it had been stocked recently. Not wanting to be part of that circus, I stuck to my original plan and was relieved to find my spot empty. I hiked for a couple minutes downstream and proceeded to work my way back upstream, systematically covering water. Within 10 minutes, I hooked into and landed a 15+ in. sucker! When I stuck it, it flashed with such ferocity I thought it was a huge bow. Needless to say, I wasn't as happy that it was a sucker but considering how well it fought, I really wasn't upset at all. A few minutes later, I hooked into my first brookie and followed it with 5 more and a couple of small shiners (good to see that they are more active- a sign of better fishing to come). All fish but 3 came on #18 BH flashback hare's ear, the other's falling victim to a #20 black zebra midge. One of the brookies (pictured below) was significantly larger and fought much harder than any of the other stockies. I first thought was that it was a holdover but then I found it hard to believe that anything could have survived after last summer's drought. Maybe it migrated all the way down to the deeper holding water downstream then came back up when conditions were more favorable or it got washed downstream during the last heavy rain. However compelling these ideas are, it was more than likely an early plant assuming they stocked it again recently. For those of you who want to get out, the flows are coming down but are still high in some places. Be mindful as you wade and don't cross a spot where you think it looks too risky. 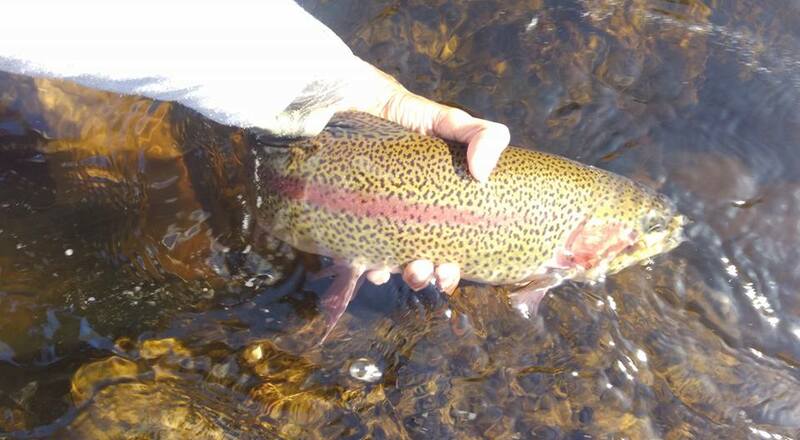 With the flows as they are now, fishing is actually fun and challenging. The challenge seems to be finding the fish as there is more water to fish now. When you find the fish and present the fly in the strike zone, the strikes are unmistakably aggressive since they have to decide within a couple seconds whether or not they want it. On my way out, I ran into a spin angler who also did well. We chatted for a while before we had to go our separate ways. If you are reading this, it was nice to meet you Frank! On a side note: the alewives and herring haven't moved into the river yet in full force. This time last year, you could have walked across the river on their backs! Great post! A small Hare's Ear is truly magical. I agree! The mayfly hatch is right around the corner.